Commonly used in nursing homes, this alternating pressure mattress overlay system operates on a fixed system so no adjustment is needed. The alternating pressure is adjusted automatically and the alternating pressure cycles every 5 minutes. This alternating pressure pad and pump system will help to prevent and heal stage 1 bed sores. Alternating pressure pad systems are often used as a temporary or cost effect solution for pressure prevention. 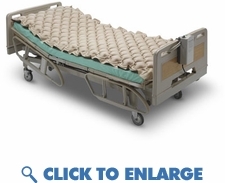 This alternating pressure mattress system is suitable for treatment of pressure sore stage 1 prevention and healing. The alternating pressure pad system uses patented air compressor chamber with ultra-quiet operation Industrial model commonly used in nursing homes and rehab centers. This pad system uses a heavier vinyl material and is more durable than standard home models. This alternating pressure mattress is easy to clean and can be used with a standard cotton bed sheet. Commonly used in nursing homes, this alternating pressure mattress overlay system operates on a fixed system so no adjustment is needed. The alternating pressure is adjusted automatically and the alternating pressure cycles every 5 minutes. This alternating pressure pad and pump system will help to prevent and heal stage 1 bed sores. Alternating pressure pad systems are often used as a temporary or cost effect solution for pressure prevention. This alternating pressure mattress system is suitable for treatment of pressure sore stage 1 prevention and healing. Industrial model commonly used in nursing homes and rehab centers. This pad system uses a heavier vinyl material and is more durable than standard home models. This alternating pressure mattress is easy to clean and can be used with a standard cotton bed sheet. Aids in the prevention and treatment of pressure ulcers. The design of this bubble pad allows greater skin contact. Size of Pad: 35.5"W x 78.5"L.